This would be our 35th visit to "Cordillera de Los Andes" elderly home ("casa de abuelitos") come and share your joy of living. The idea is share with the community in the "Tea time", so we will prepare them tea that will come together with some fruits, juices and cookies without sugar of course. Also per month we give them (abuelitos) a nice surprise like music, dance, theater, others. If you know a group who can help us this month to entertain to abuelitos, please contact me. 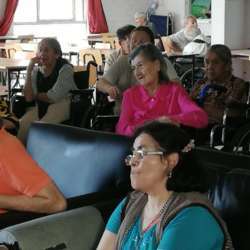 This retirement home is a residence around 93 people that form part of the first three socioeconomic segments that are beneficiaries of the new housing policy in Chile. Most of these seniors are never visited by their families once they are left there sadly vulnerable and never visited. Some have disabilities and some very advaced age, some were abandoned with no place to live and others beaten before the came to this home by their own family members. So our main goal is to cheer them with our visit once a month giving them lots of love and doing special activities with them.